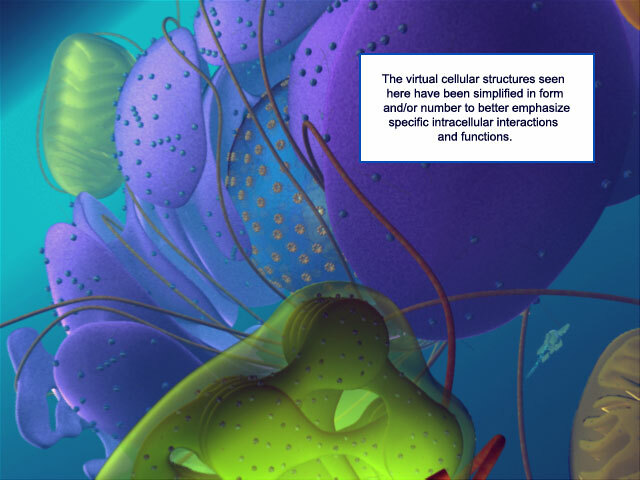 We invite you to explore our virtual cell by taking a guided virtual tour of certain basic functions going on within the cell as well as the intracellular locations where these events occur. Welcome to the NDSU Virtual Cell. 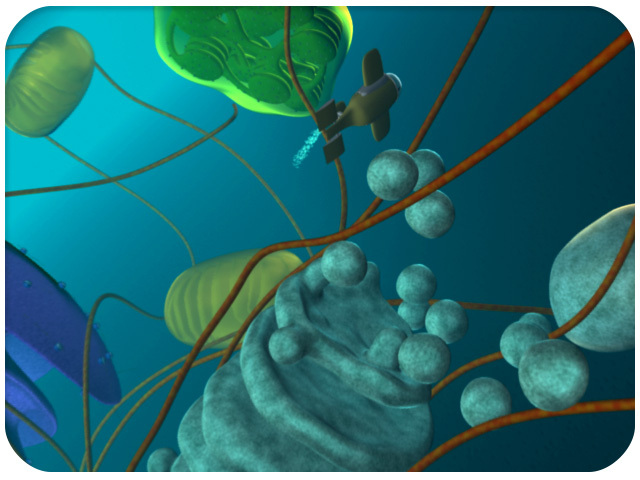 It’s time to climb into one of our cell submarines and take a virtual tour of our cellular landscape. Out on the horizon, you should see a large blue object. 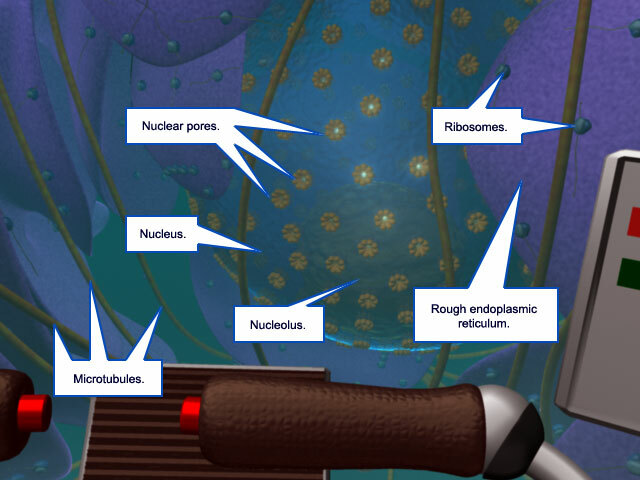 That is the nucleus of the cell. It will be our first stop today. 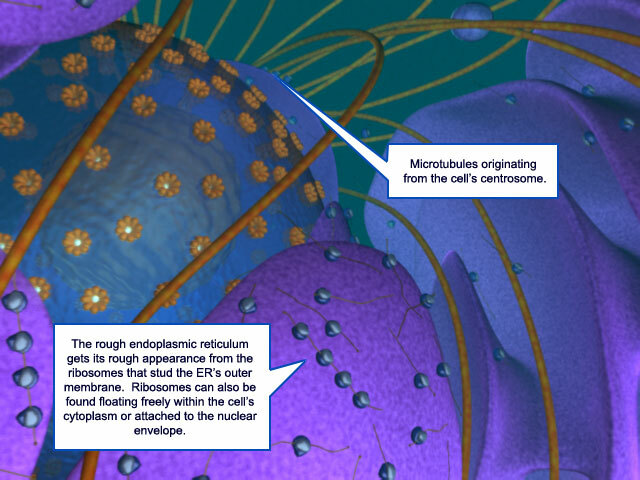 The nucleus is uniquely recognizable by the system of pores embedded within its outer membrane. Biological materials move in and out through the pores. They are the communication channel between the internal world of the nucleus and the cellular cytoplasm. The nucleus contains the vast majority of the DNA in the cell. The DNA contains all of the genetic information necessary to carry out all of the functions of the cell, as well as the tissues and organs in which the cell can be found. 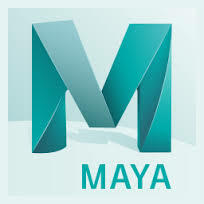 That information is mobilized first by the process of transcription. Let’s pop inside and take a short look at the process. During this process, the DNA is used as a template to make RNA. Here, you can see that process in action. The final product of transcription is then spliced and modified into one of three RNA molecules: messenger RNA (or mRNA), transfer (or tRNA), or ribosomal (or rRNA). These are all important components of the process call translation that is used to make proteins. 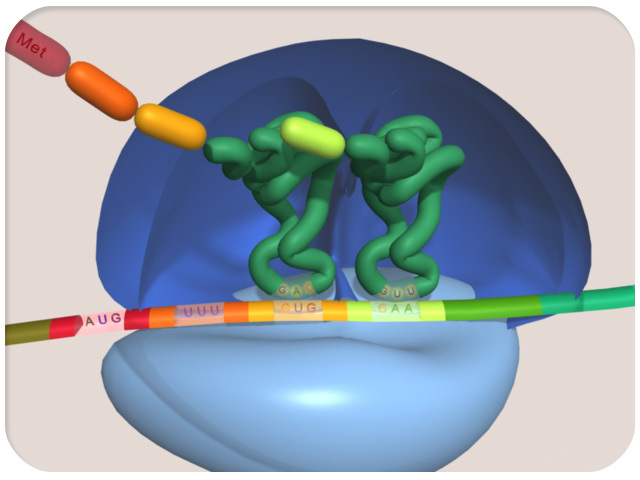 If we follow the final RNA products out of the nucleus we can see them in action during the process of translation. Here you can see a particulate organelle called the ribosome. It is partially composed of the rRNA we just spoke of. Attached to it is the mRNA. 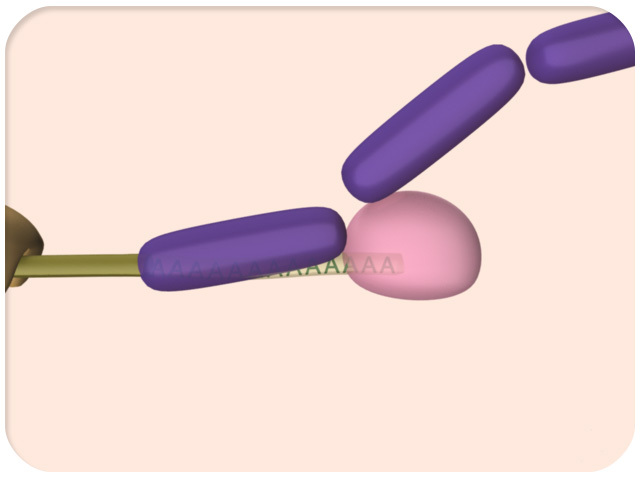 As translation starts, a tRNA molecule binds to it and delivers the correct amino acid. As the protein grows, additional amino acids are brought into place by the correct tRNA molecules. The correct tRNA is determined by triplet codes found in the mRNA. Proteins are the product of translation. Although some of these proteins stay within the cytoplasm, others are trafficked to different locations within the cell and some are exported from the cell. Most of this trafficking involves the endoplasmic reticulum (or ER) and the golgi apparatus. We are now looking at the ER, or endoplasmic reticulum. Some of the cell’s ribosomes are attached to the ER and the proteins they manufacture are inserted directly into the space inside the ER. Those proteins can be packaged into vesicles which depart the ER and migrate to the golgi apparatus. 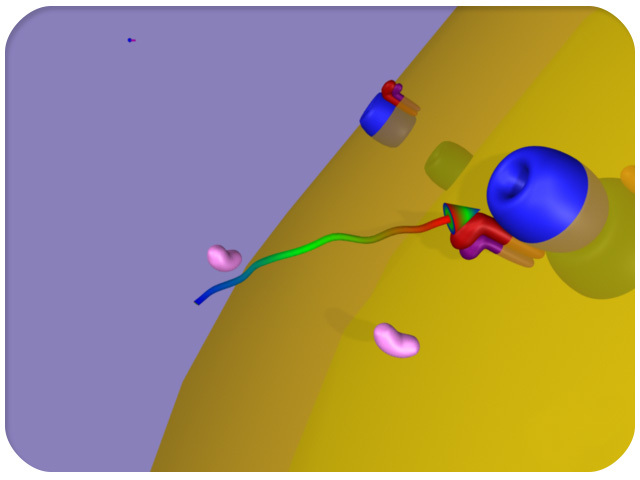 Here, the vesicles merge to form a golgi cisterna with the proteins located inside the cisterna’s membrane. As the cisterna matures, enzymes inside can modify the protein. This modification creates a molecular tag that is used to target the protein to a specific cellular location. Eventually, the cisterna will mature into the trans golgi network. 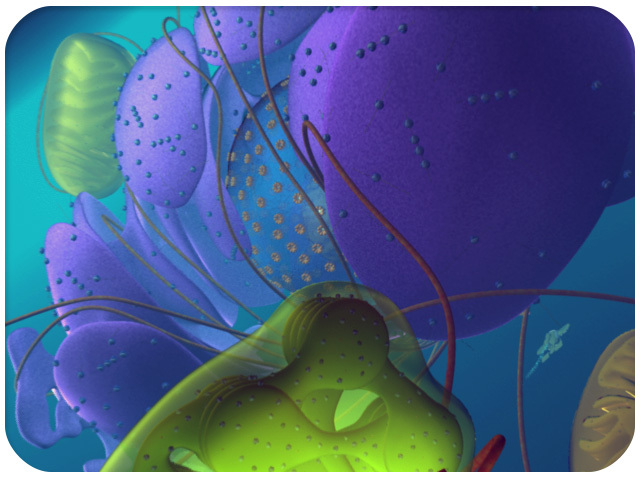 From here vesicles can deliver proteins to cellular locations such as the endosome or the cell membrane where the proteins can be embedded or exported from the cell. Once proteins have been translated, they can also be delivered to other organelles in the cell, such as the mitochondria and the chloroplast. Delivery here is by a different process. 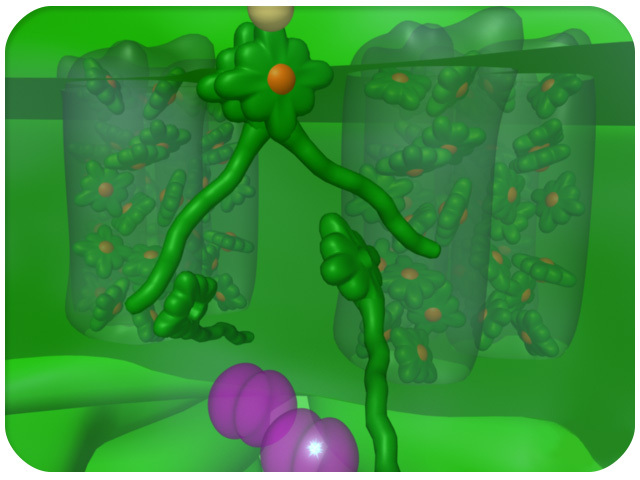 Some proteins are produced with transit peptides. These are specialized sequences on the end of the protein recognized by pores in the mitochondrial membrane. 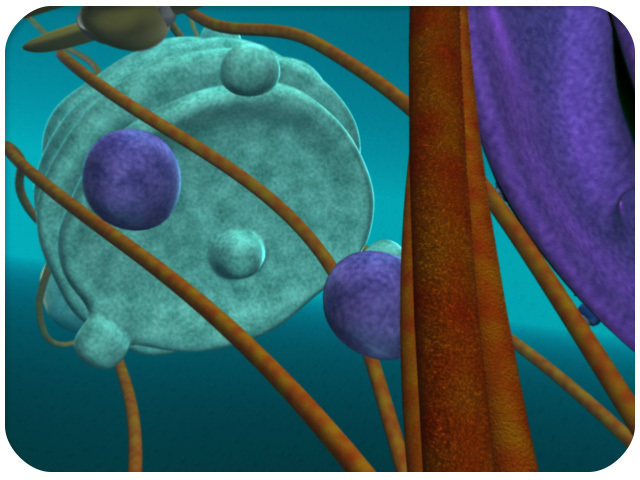 With the help of additional specialized proteins, the protein is delivered into the organelle. 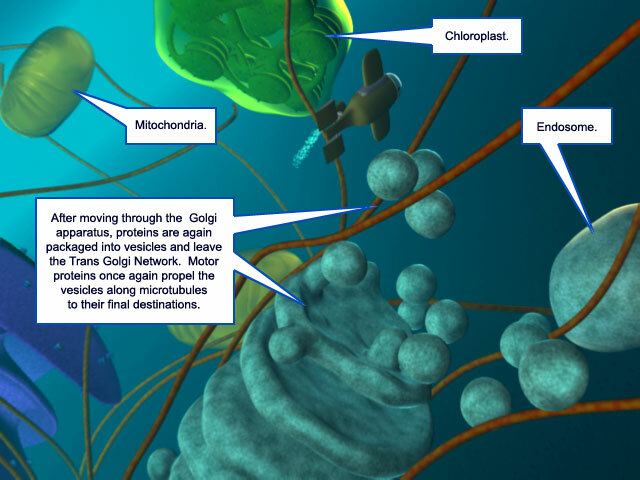 Transport to the chloroplast involves a similar process. 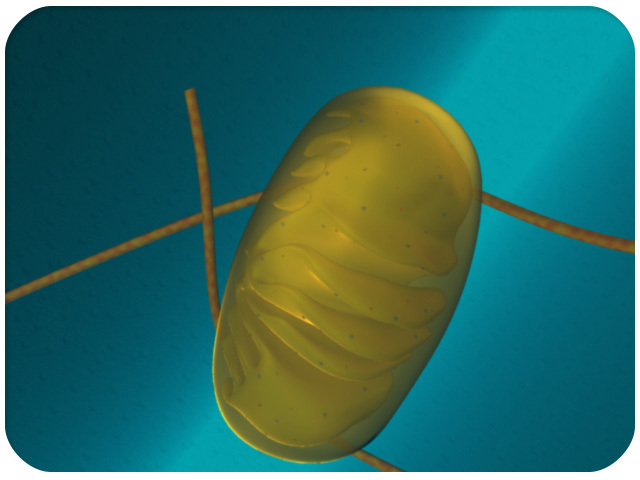 Mitochondria and chloroplasts are the sites for unique cellular processes. We’ll first look at the mitochondria. This organelle produces ATP, an energy molecule that is used by many other cellular processes. ATP is produced by a complex in the mitochondrial membrane called ATP synthase. The energy to produce ATP is provided by a gradient of protons (or hydrogen ions) found on the two sides of the membrane. Protons flow from the area of high proton concentration through the ATP synthase, to the area of low concentration. As they flow through ATP synthase, ATP is produced. This gradient is produced by the action of the electron transport system. 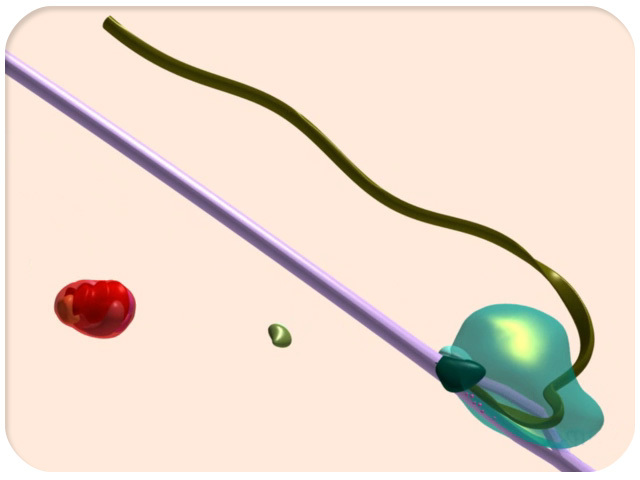 As electrons are passed from one carrier to another in the system, protons are pumped across the membrane. This creates the gradient required for ATP production. Here we see can see the electrons moving between the carriers. 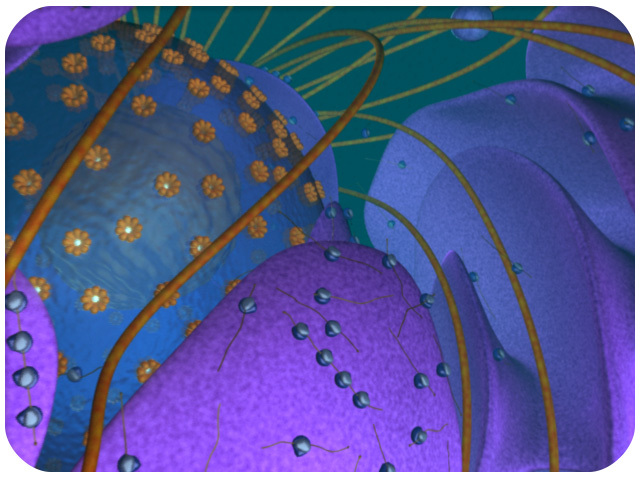 Finally, we see an organelle only found within plant cells. 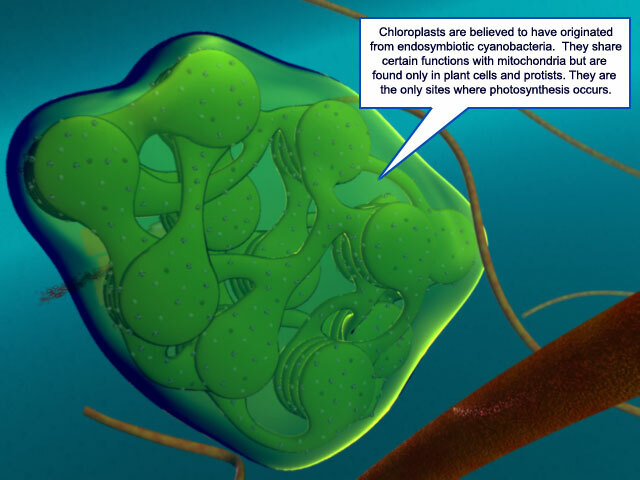 This is the chloroplast. Here light energy from the sun is converted into chemical energy in the form of ATP. As with the electron transport system, electrons are passed from one carrier to another and protons are passed across the membrane. The gradient this creates produces ATP by a similar ATP synthase complex. It begins with a photon of light that produces the energy necessary to release an electron down the carrier chain. 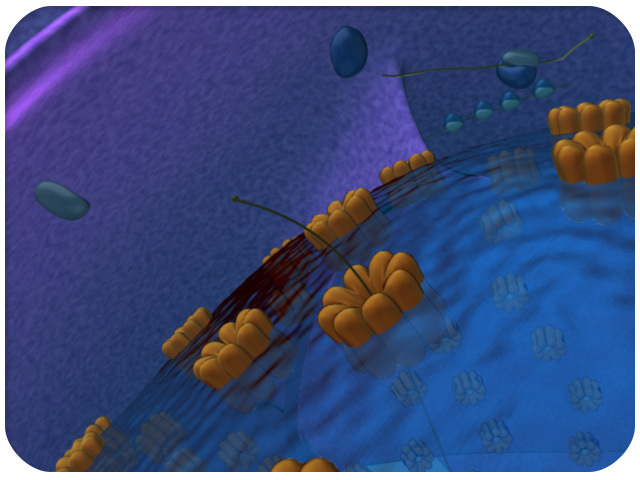 Here you can see the electron moving between the carriers along with ATP being produced by ATP synthase. And that brings us to the end of our fly through. There are many processes going on within our virtual cell, and this trip featured only a few of the major functions. We are always working to expand our collection, and we hope you will return to explore our newest additions. The nucleus contains most of the DNA in the cell. It is recognizable by the protein complexes known as nuclear pores embedded in its outer membrane. These pores are responsible for facilitating the flow of biological materials in and out of the nucleus. Transcription occurs within the nucleus. 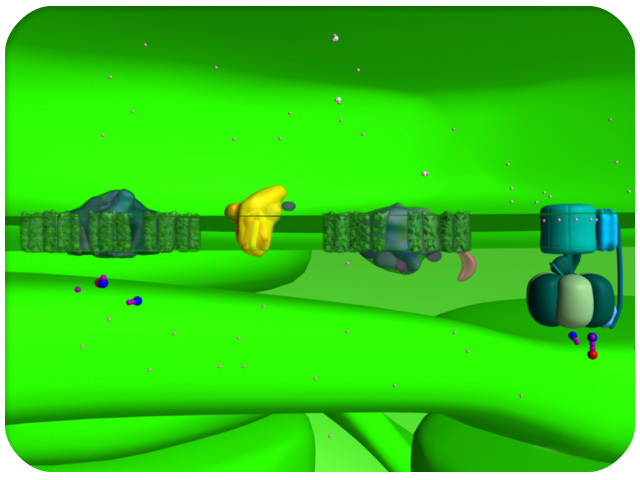 Through this process the information in the cell's DNA is used as a template to create RNA. 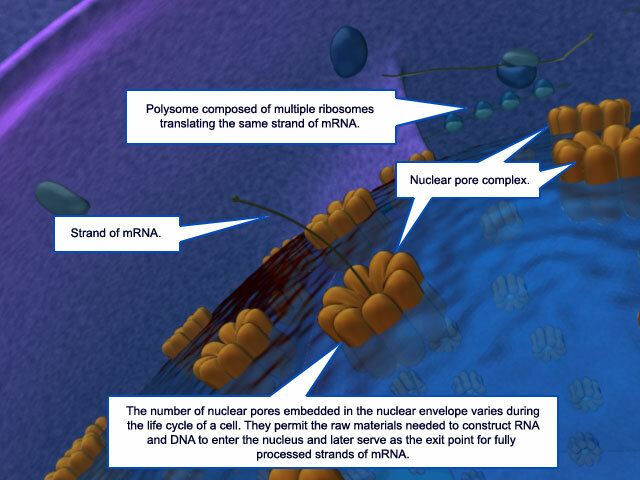 The RNA is then modified into one of three types: mRNA, tRNA, or rRNA. Pre mRNA must be spliced to remove non-coding sections called introns. The remaining sections, called exons, are then spliced together. After splicing, pre-mRNA is processed further by the addition of a methylated cap and a poly-A tail. 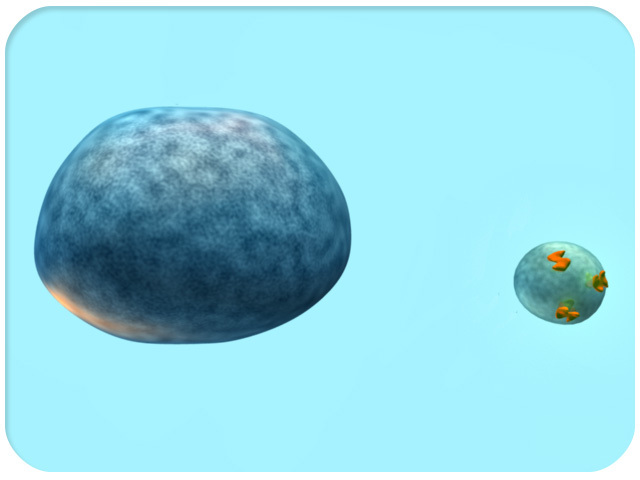 After being spliced and modified, the finished mRNA strand leaves the nucleus through a nuclear pore and enters the cellular cytoplasm. After entering the cytoplasm, mRNA binds to a ribosomal subunit and serves as a template for translation--the process by which ribosomes, mRNA, and tRNA join together and build proteins out of specific amino acids. Ribosomes can be found floating in the cytoplasm of the cell, or attached to the endoplasmic reticulum or nuclear membrane. 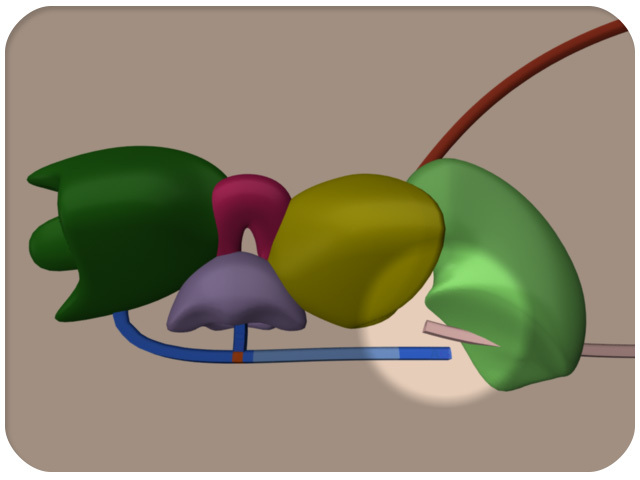 Ribsomes attached to the ER insert the proteins they translate directly into the space inside the ER membrane. Proteins from inside the ER can be packaged into cargo vesicles and transported along microtubules to the Golgi apparatus for further modification and distribution within the cell. 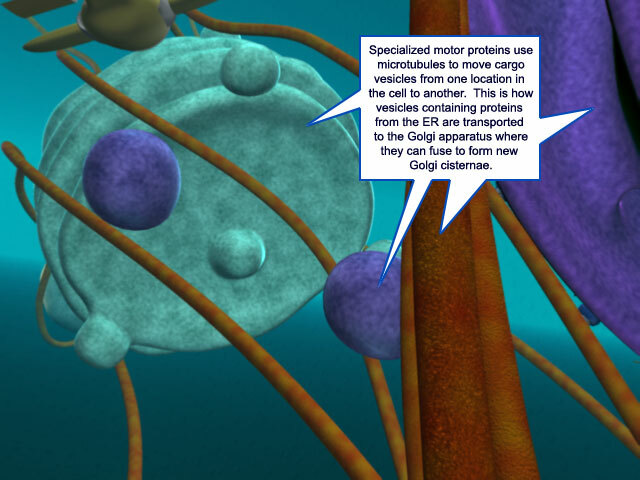 Inside the Golgi, some proteins are modified with specific molecular tags. 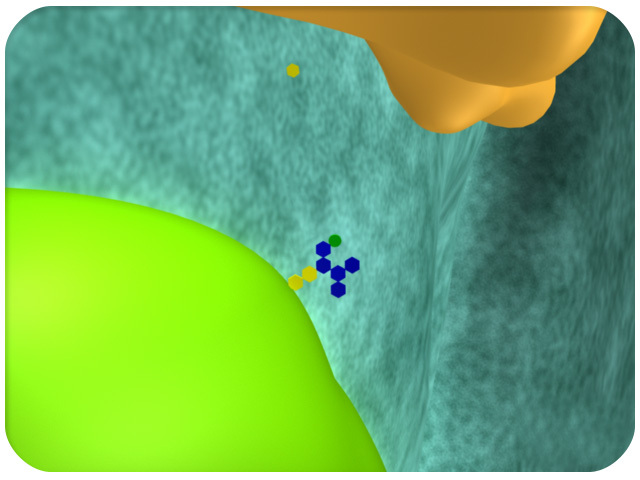 These tags help to target the protein to its final destination. As the Golgi cisternae mature, they eventually join the Trans Golgi Network and break off into transport vesicles. These vesicles contain proteins destined for specific locations within the cell. Hydrolase enzymes are tagged for delivery to organelles such as the endosome. Other proteins like interleukins, are destined for delivery to the cell's plasma membrane where they will be secreted from the cell. Proteins can also be delivered to organelles such as mitochondria. Delivery here involves several specialized proteins. 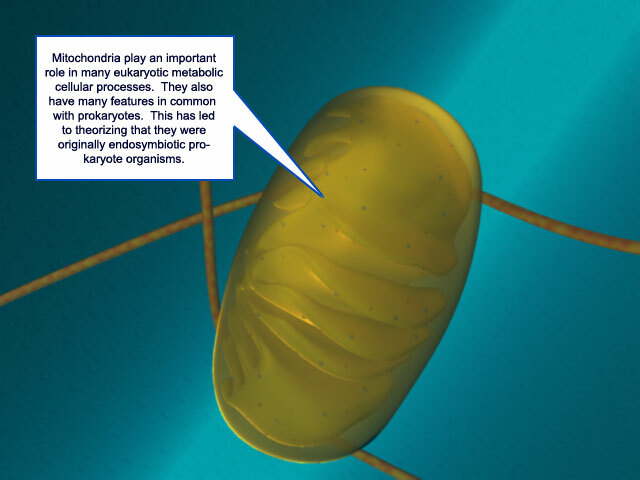 Mitochondria are organelles that produce large amounts of ATP, an energy molecule used in many cellular processes. 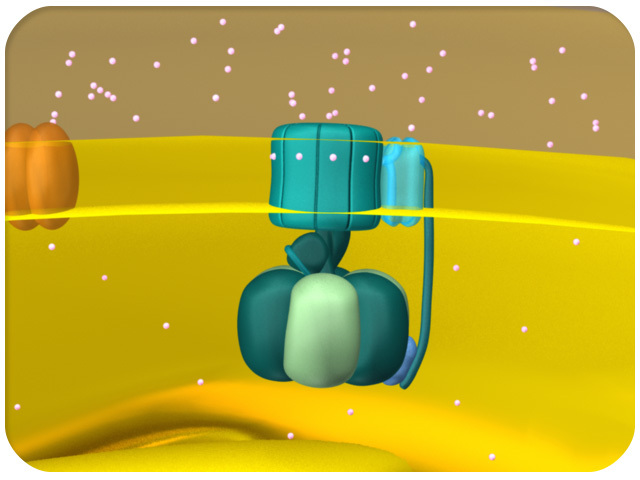 ATP is produced by a complex called ATP Synthase embedded in the mitochondrial membrane. ATP Synthase uses a proton gradient to power ATP production. This gradient is maintained by the transfer of electrons through a chain of complexes called the Electron Transport Chain (ETC). In plant cells, another organelle called the chloroplast can convert light energy from the sun into chemical energy in the form of ATP through the process of photosynthesis. Much like the electron transport chain, photosynthesis involves electrons being transported between membrane bound complexes. This maintains a proton gradient that powers a similar ATP synthase complex and powers the production of ATP. 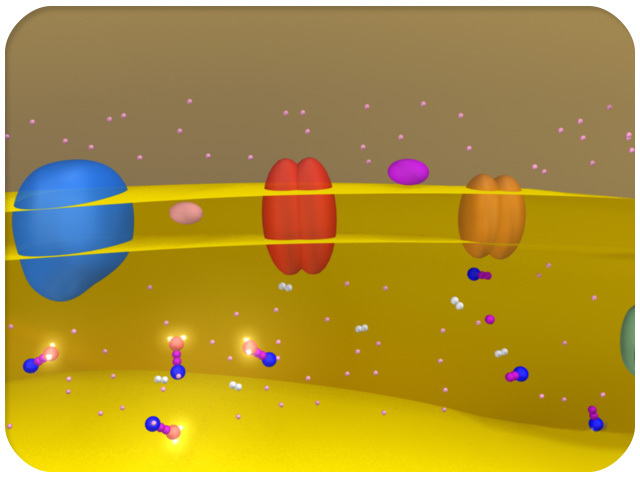 In photosynthesis, capturing the vibrational energy of light also powers the creation of molecular oxygen from the splitting of water molecules. 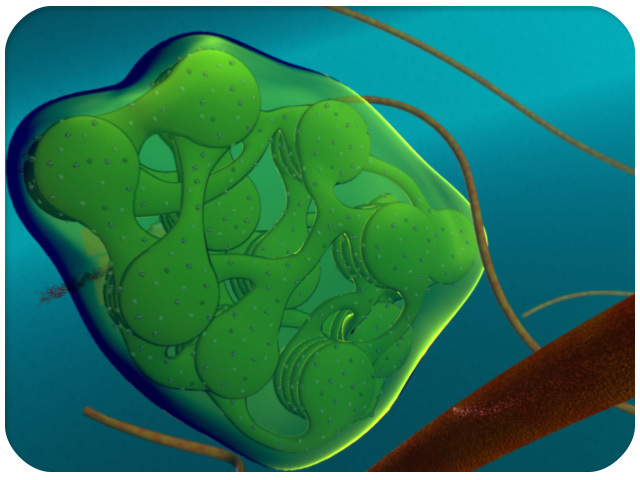 This occurs in the oxygen evolving center of a complex called Photosystem II. 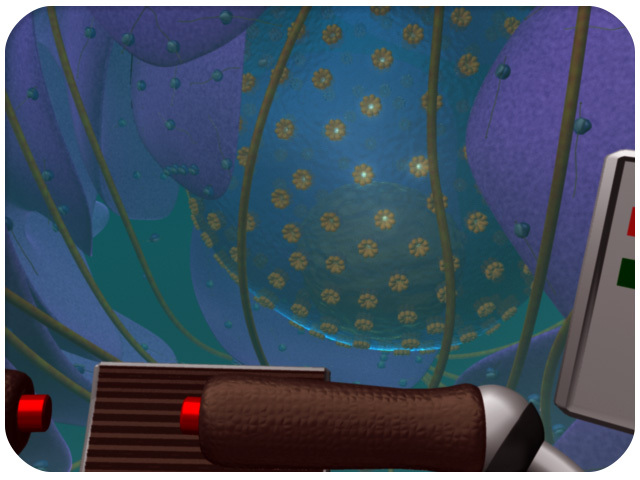 And that concludes our tour of the major organelles and processes found within our virtual cell. We are working to add additional visualizations, so we encourage you to come back to take advantage of our newest additions.